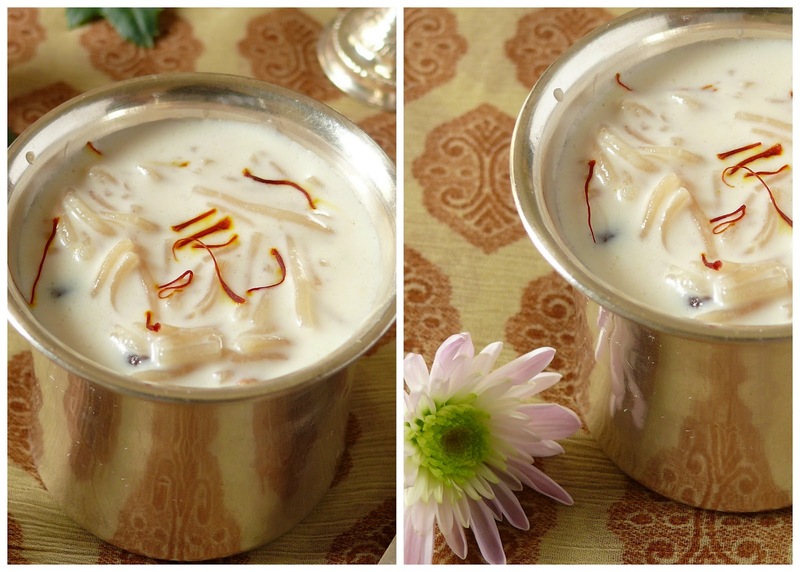 Semiya Payasam is the easiest among the many Payasams made in Tamilnadu. 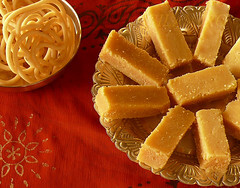 This variety of Payasam is most often made as an offering to God on any festival day. I made it for the Tamil New Year`s day as part of the feast which consisted of Sambar, Rasam,Vazhaikkai varuval, Mangai Pachadi, Vadai, and Appalam. 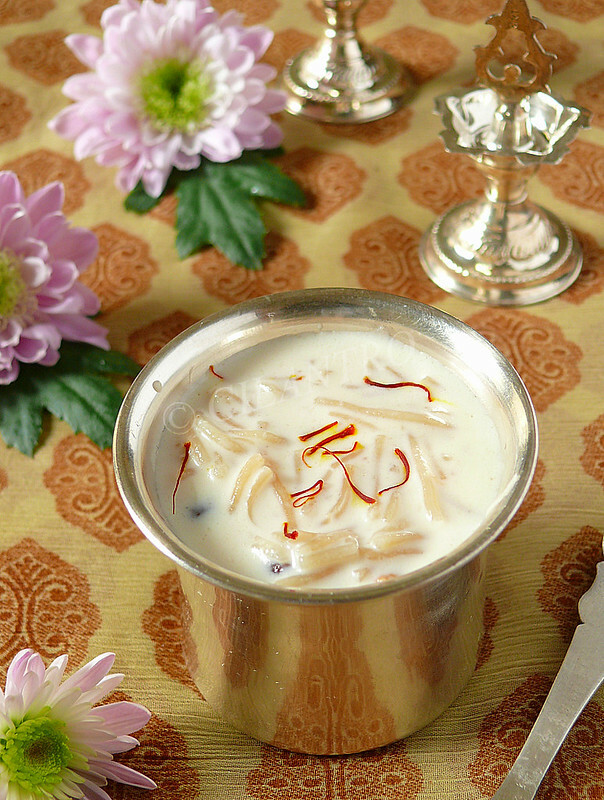 Semiya Payasam is prepared with Indian vermicelli roasted in ghee and cooked to perfection in a milk and sugar concoction. Flavored with cardamom, a slight pinch of edible camphor and roasted cashews and raisins, this Payasam is simply delicious with a heavenly aroma. Heat a pan, add a tablespoon of ghee and toast the cashews to a light brown color and then add raisins till they balloon up. Remove from pan and keep aside. In the same pan, add the semiya/vermicelli and roast it to a nice aroma and it turns to a light brown color. Remove from pan and set aside. To this add water and cook completely. Add sugar and milk and let it slowly simmer for about 5 minutes, stirring it once in a while. Now add the evaporated milk and bring to a boil. Now add the toasted cashews and raisins, cardamom powder and camphor(powder and mix with a teaspoon milk). Mix well and let this cool completely. Add half & half just before serving. Serve warm or refrigerated. It tastes good either way. TIPS: After a while the semiya absorbs the milk and the Payasam tends to condense or thicken. Reserve some milk and add it just before serving. Increase the quantity to 3 cups milk if evaporated milk is not used. Condensed milk can also be substituted for Evaporated milk in which case reduce the sugar because the condensed milk is already sweetened. I have used whole, evaporated and half & half. The payasam can be made with whole milk alone. 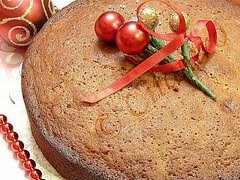 I grind the cardamom with sugar in a mixer if sugar is not added then reduce the quantity. Delicious payasam with nice clicks. I love this and I make brown rice vermicelli. It gives the exact same taste as payasam. Love the fact that its so easy to make.. I love semiya payasam. It is quick and easy to make. I love how you have clicked the post. Feels so good. Nothing can beat the simple pleasure of warm vermicelli payasam in a silver "lota".. Pristine.. Lip smacking kheer, looks appealing!! whats is half & half here?????? i dont know this ingredient :-? Half and Half is a dairy product consisting of half light cream and half milk. You could add half the quantity of cream alone. Super delicious payasam,looks super rich and creamy..